With the downtown commercial real estate market in a free-fall, his plans for moving Lampreia into a grand new space in the nearby Gallery building off the table, and his Belltown restaurant looking at a slow year ahead, Scott Carsberg did what he says he had to do. The James Beard-award winning chef closed his four-star restaurant Tuesday. He’s in the process of remodeling Lampreia, set to reopen mid-February as Seattle’s second Venetian-inspired cicchetti bar, Bisato. 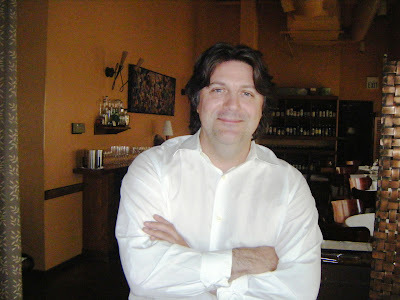 Scott Carsberg, at Lampreia in 2008. It’s a serious shift for this serious chef, whose creativity in the kitchen has won him national attention while his polarizing personality has earned its share of devoted fans as well as detractors. As a devotee who’s been in the “He’s a culinary genius!” camp since Lampreia made its 1992 debut, I still salivate at the memory a simple saute of razor clams, a powerful veloute of celery root, and many a veal chop emblazoned in my culinary consciousness by Carsberg’s practiced hand. I’m not pleased to report that one of my favorite restaurants no long exists, though the chef says Lampreia may yet be resurrected. “I’m still actively looking for a location,” he insists, suggesting the move to new digs has been “postponed” rather than deep-sixed. But for now, motivated by his wife and business-partner Hyun Joo Paek, he’s being a realist. “The real estate market is in the toilet. It’s tough times,” Carsberg says. And rather than move into a mixed-use development caught up in the fray, he’s determined to hunker down at First and Battery where nearly 20 years have passed since he opened the doors at Lampreia. In Belltown, as restaurants are dropping — or fleeing — he’s going with the flow, and the flow calls for comfort foods and cocktails, priced to entice. At Bisato (“in Venetian dialect it means the same thing as lampreia: the eel“), he’s reconfiguring the existing space, opening up the kitchen and installing a 16-seat bar and eating-counter, a handful of small tables, and instituting a menu heavy on the appetizers and intermezzo. Unlike the more formal setting, Bisato will be quite casual, with reservations taken for parties of six or more only. We can expect “simple, inexpensive food made, as always, with high-quality ingredients,” Carsberg says. Among the specialties will be salumi sliced to order on “the Ferrari of slicers.” And cicchetti — Venetian noshes to include sausage-stuffed peppers or marinated bocconcini and calamari, with regional Italian wines to match. “I’m excited, because I want to have some fun,” Carsberg told me. Me? I’m still trying to muster up some excitement in light of the loss, and smacking myself for not getting over there one last time before Lampreia closed. Bisato will be open daily (except for Mondays) from 4:30 p.m.